New South Wales, Australia. Towns, Cities and Localities. New South Wales (NSW) is Australia’s fifth biggest state and covers an area of 801,428 km². If it were a country in its own right, it would probably be the 37th biggest in the world, just behind Pakistan but ahead of Turkey. 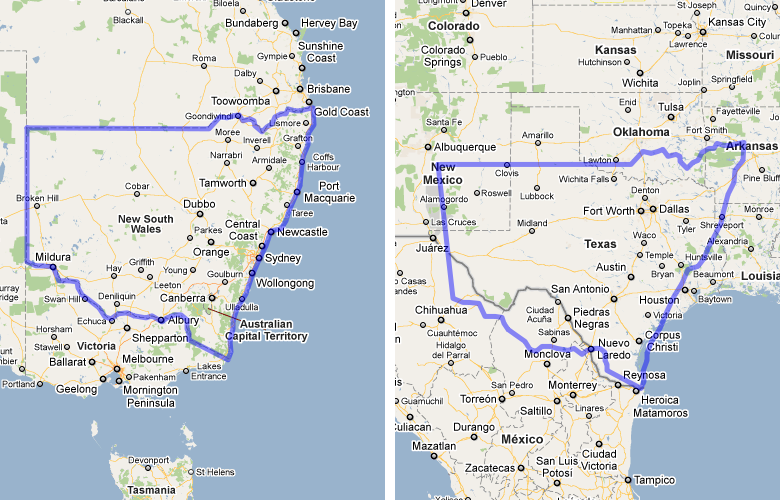 The UK could fit into NSW about 3 1/4 times and it is bigger than California and New Mexico put together. It has a population of around 7.41 million people. It is known as “The Premier State” and the residents are known as “Cockroaches” – very nice! The second most visited location in NSW is why Byron Bay, Australia mainland’s furthest point east. But the main attractions are, of course, Harbour Bridge and the Sydney Opera House, both in Sydney. Famous Australians originally from the state include Clive James, satirist, Paul Hogan, comedian turned Crocodile Dundee, Kerry Packer, media magnate and film directors Baz Luhrmann and Peter Weir. Sydney is the capital of New South Wales, but there are plenty of other towns and localities with a population in excess of 10,000 people. It’s good to see how helpful and supportive you are to all those confused and seeking minds. Well, I am looking for a good institute or college offering Yoga teachers training courses. And I have found Byron Yoga Centre in Byron Bay offering a year long course. Would you be able to tell me if it’s going to be a good decision to come to this city for the course in terms of living there and also finding jobs. Also my 10yrs kid will be accompanying me so I will have to find schools for her too. Very confused if it’s going to be a good decision or not. Pls help me with your views ! I love Byron Bay, it’s probably my favourite town in all of Australia. It’s very much Hippiesville, it’s the Australian capital of the alternative lifestyle. It’s a very busy town, I think I read somewhere that it is the second most visited place in New South Wales after the Opera House. The downside though, is it’s very expensive, accommodation doesn’t come cheap. It’s busy too, lots of tourists and the roads near the town can become gridlocked. Whether or not it would be a good decision for you and your young child though, it’s hard to say, but the place does buzz, so I’m sure it does have a decent school in it and work available for the right people. I would like to know about the far south coast, NSW area, as an immigrant (489 visa) which area in this region is most suitable for a job, living, and quality of life, for a new person who has not much idea about this region of FSC,NSW, how he/she can come here and start a good living. what would be the average cost of living there, how long it takes to find a job, and the weather conditions? kindly I am looking for an expert advise from the ones who know about this area in detail. Yes, you will definitely need someone who knows the area well to help you with this, so that counts me out. Can anybody help Sunny with this? Hi Sunny – even I am due to move to Far South Coast in April 2018 and looking for some good knowledge about which area is good to move to within Far South Coast which provide decent accommodation, employment and schooling options. Any help on the information related to these would be appreciated. I am also an applicant to move into far south of NSW. The far south coast of NSW is rich in natural beauty but poor in job opportunities. If you live in the northern tip of the far south coast you will be in the Shoalhaven where the bulk of the people are, Nowra is about an hour from Wollongong (10th largest city in Australia) so you might be able to work there for a greater opportunity. Nowra however isn’t the nicest place around. Yes, I know what you mean about Nowra, it was featured on a TV show recently called ‘Ice Wars’. Very sad. Hi Bob, I am currently in the U.K. but have spent many years on the Central Coast of NSW. I am happy to answer any questions people might have on the areas from Gosford to Wyong and into/up to the Hunter Valley and Newcastle. I have also spent many years in Sydney – mostly Eastern Suburbs but also Riverwood (Southeast Sydney). Just thought I’d let you know that I can help out answering questions about those places. Your website is fantastic – thank you for taking the time to build it. Hi Sammie and thank you very much for offering to help. The areas you know well are not places I know at all really, other than having driven through them once on a road trip about nine years ago. So yes, if you can help people out, that would be great. Hopefully you have subscribed to the comments on this page so if anyone does ask, you will see it here. Glad to hear you like my website as well, it’s actually been fun putting it together. Many thanks for your offer on Bob’s site to give advice on Sydney and the Central Coast. Currently living in London with three fairly young kids (10, 7 and 7 – twins) and an Aussie/Kiwi wife itching to get home! Seriously considering a move to Aussie/NSW but ideally not wanting to be in the heart of the big city, although our jobs dictate we’ll probably need to work there to earn a decent living. Thinking about North Shore Sydney or more creatively a little further out, even Central Coast if there’s ideally a good train connection into the city for commuting. Car an option although would prefer public transportation if possible – recognising that links won’t be as good as into London. We’ll need a 4-5 bed place ideally on or near the coast and very good accessible schools – private or state. Would be grateful for any thoughts you may have. Sammy doesn’t appear to be around at the moment, but hopefully will see this comment soon and help you out. Or maybe somebody else will see it and give you some advice. From what I know, North Shore is hugely expensive, and I mean massively high priced for housing. Not sure what went wrong but I’ve only just seen your post and questions!! Where are you at with your move? Do you have any more specific questions or would you like me to respond to your original questions? You are a social worker. As a rule, your options for work are greater in the more socially chaotic and dysfunctional ares, though this will be at odds with your choice of residence. The GC is a growth area for your trade, with a strong contingent of meth-heads & dysfunctional families, though one which offers good choices for living. It would probably be also pretty good for a tradie, given the number of accidents there. I know one social worker who worked there for a long time and it was pretty intense. To me, that means at some point new facilities will emerge and therefore new work opportunities. Fortunately, the Goldie lies close to the border of NSW, so northern NSW is another option if you like it quite hot. You could look at Byron Bay to work which has opened up a new hospital recently. Alternatively, Lismore or surrounds. Try to keep the drive under half an hour. Forget about public transport around the GC or northern NSW unless you are working very local to your residence. Lismore itself is not somewhere I would live, but may have work options and around the area it can be very pretty. Your buy up to price would easily get something great. If you are undecided and want to rent in NSW, your options are manifold. I would get the realestate.com.au app and research all towns in your price range. Hi Sarah Just reading your post and thought id chip in.. My specialist area may be considered Melbourne so cant help on area but thought id point a couple of things out. Beach and pool…. both are really not needed We bought pool and close to beach and the beech has seen about six trips in nearly two years (11 and 9) mostly when we are nowhere near home. Sand gets everywhere so pool it is…Id be amazed if yours are any different..
You’ve already been given some good advice here Sarah, for what it’s worth, here’s what I think. Yes, yes, yes! Do it! Nothing wrong with New South Wales at all, and if you really love the Gold Coast, just go to northern New South Wales, you’ll be 20 minutes or so drive from GC. If you don’t like it, two years will pass quickly, and who knows, it might just get harder and harder to move here so if you wait, you may blow the chance. I currently live in Grafton which is in the Northern Rivers district of NSW. I visit the Gold coast every now and then as it is only a few hours away. However there are a great many towns closer to the border that would let you work in NSW and be close to the Gold Coast. Places to Look at would be Lismore (population around 30k), Ballina (Population around 8k) Byron Bay (Population around 5K) or if you really really want to be on the Gold Coast Tweed Heads (Population around 8K) cross the street and you are on the Gold Coast and need to change the time on your clocks. I will be Migrating with my family to NSW under the 190 visa ,I am a civil engineer by profession and my partner is an IT engineer .In fact ,I am wondering weather which area would be preferred to settle.Although many has recommend Sydney suburbs, it is obvious that cost may be high. Can you let me know which suburbs would be better.Does any body have idea about Kings Langley ,concord and Wollongong ?? Dylan, you would be much better off checking out the comments on my page about Sydney, there’s lots of talk about the suburbs there. In fact I think Kings Langley and Concord were mentioned very recently. Other than that, hopefully somebody who knows these areas well will answer your comment here, more particularly about Wollongong. Being in Brisbane, I’m afraid I just don’t know the areas you have mentioned well enough. We are looking at possibly moving to newcastle in may with my partner and toddler. Was wanting to know good areas to live in and what is the weekly rental is roughly around for a 2-3 bedroom house 🙂 is trade work also easily come by in Newcastle?? I don’t know the area well Emma, but my pages Which Suburb?, Cost of Buying or Renting a House in Australia and Getting a Job or a Sponsorship can help you with your questions. Hopefully though, somebody who does know Newcastle well will read this and give you a better answer than I can based on their experience of the area. generally the good areas are also the expensive areas. Most of the people I spoke to indicated the following suburbs were the best The Hill (yes we have names like that) Cooks Hill and Hamilton as the best. However best also means more expensive in the region of 600 or 700 a week for a modest place. Newcastle is one of the bigger cities, not a terrible commute to Sydney if needs be so opportunities for work are better than most places around. Well, I’ve never been to Wagga Wagga, so I couldn’t tell you, maybe somebody else reading this will let you know what they think of it. I do know that it was voted Australia’s most family friendly city in 2014 though, so I reckon you and your family can look forward to your move. Hi we have received our sponsored visa acceptance today and moving out in November. My company however have now changed the destination from Port Macquarie (which we researched) to the central coast, so due to short notice could you/anyone please advise on best suburbs or places to live on the Central coast. My wife has quickly looked on dated posts and the feedback is not so good with high levels of anti social behaviour in certain areas. I know there is good and bad in every area but the feedback Is completely different to what was read about Port Macquarie. All I want to find is a nice safe area for my wife to feel comfortable in with the thought of paradise, while I am obviously doing the considerable hours working in a new country for a new employer. We have seen that Terrigal, Avoca, Copacabana and Green Point are the best places to live is this correct please? I am not bothered about commuting or entertainment, just want safe and hopefully picturesque area to rent. I’ve driven through the Central Coast, it’s a very pretty part of the country, but I’m afraid I have absolutely no idea what it’s really like to live there. So I’m afraid I will have to pass on this question Mark, but hopefully somebody who does know the area well will see this and help you out. Anybody got any advice for Mark? I live in Umina Beach. The places you mentioned Avoca, Terrigal, Copacabana, Green Point, all beautiful, if a little pricey. Green Point has no beach, the other 3 do. Most places in the Central Coast are fairly tranquil, Umina is quiet, there is the odd hoon who does a burnout up the road, but generally it’s peaceful. The places you mentioned are areas that are generally middle to upper socio economic level, but are also furthest from the motorway, if you need to travel for work. The lower socio economic areas tend to have more crime, the worst I heard of is Charm Haven / Blue Haven area. The Entrance, Long Jetty, Bateau Bay are also very nice. The whole area has lots of trees, lakes and beaches and is a great area to live. I’m assuming as your post is quite old that you,got the info you required about the central coast. If not, I lived there for many years and can answer any questions you might have. I am planning to migrate to the Far South Coast in NSW – the region we have chosen is Nowra which also consist of four cities, Shoalhaven, Eurobodalla, Sapphire, Illawarra. Which of these would you recommend as the best in regards to accommodation, transport, jobs and other facilities etc.? I have a 2 year old Toddler and would prefer a place where it would be easier for her to adapt. When do you plan to move? I plan to move there very soon too. I heard Shoalhaven is relatively safer and seems to have better infrastructure. Moreover, it is close to Sydney too. Thank you. Yes I am looking to move somewhere next year in June or July if all goes well. Would be great to be closer to Sydney though considering job opportunities and so on and also the house rentals and public transport does matter too. I will research more on Shoalhaven. So I will need to leave this to the locals, hopefully somebody reading this who knows the area well will be able to help you both out. Good luck with your applications, Jacqueline. I have my fingers crossed for my application that is under process. Yes, do your research and let me know too if you come across something interesting in terms of job searching and all. Finances would be an important aspect to consider. Have you moved to the area we are discussing here, I have done some research on the area and found Nowra is better place to live and wok. Job opportunities are limited but when you have decided to move then it will make opportunities to knock your door. I am also planning to move to this area in 2nd week of Feb17. Please share your views if you are already there. Sadly it seems you have made a valid point kresh. Nowra was featured on a TV show here last week called ‘Ice Wars’ as a town with an ice problem. Nowra isn’t far south coast NSW. That would be the Sapphire Coast, ie “Monaro”, comprising Merimbula, Pambula, Bege, Eden, and a scattering of hamlets like Candelo and Wolumla…and if a bit inland, then the Bega shire. Further afield, we are talking an hour or so from Bega, is Cooma and the ski fields of Jindabyne and Thredbo. Home of the Snowy Mountains hydro scheme. There are some lovely rolling green hills in this area, between Bega and Cooma as well as around Bega, though Bega itself is ho hum. If moving to this area, ensure your employment beforehand. As for Nowra, it is not that far from the outskirts of Sydney. About as far as Goulburn, which is one of the oldest towns in NSW, a few hours inland, on the road to Canberra, which is a further hour by road. Nowra, as The Gong, Shellharbour, Shoalhaven etc is a media publicised area for ice, but truth be told, far from the worst in Oz, with many areas vying for the title. I would have put Ringwood/Lilydale, Hopper’s Crossing/Sunshine, Broadmeadows in Melbourne, maybe Franganistan, The Dandenongs. In Sydney, Blacktown, “Paris” (Parramatta), Mt Druitt, Drummoyne area, the Cross, Chippendale, Darlinghurst area….in Perth I would say Armadale, Gosnells, maybe Rockingham, Midland…in Brisbane, it would be “The Velley” (fortitude valley), Logan, though Bob has stated it is another city. It is essentially outer Brisbane to the south, much as Caboolture-Redcliffe, another hotbed of meth use, is to the north. Both Logan and Caboolture have become part of Brisbane with urban sprawl. Surfers Paradise is another heavy ice area. In Hobart, avoid Bridgewater and Gagebrook for the same reasons. As a rule of thumb, look at the prevalence of security grilles on windows. That gives you a pretty good indication of what crime is like. These are ubiquitous in Sydney. In Alice Springs you will see broken glass cemented walls with razor wire. Good day. Have you moved to far south coast and settled over there? I recently got 489 in field of IT and planning to move. Looking for an ideal area in terms of job and rental cost effectiveness. Your input in this regard wilk be very productive for me. I am hoping that you would have already settled in NSW. I am due to move in mid June 2018. I am in the process of researching the best place to start our lives down under. My wife and myself have got the regional sponsored visa for far south of NSW. However I am not very sure which cities or towns that include. I suppose getting a decent job in the IT field with a affordable house to stay would be our immediate needs. Also the safety factor of the neighborhood. Please give your insights on how you went about setting up yourself in the area and any tips that would help us to get us going once we get there. Very much impressed with your forum and its very helpful as well. I am planning to migrate to NSW and I have seen that you are not so familiar with the state about expenses, best places to stay etc. But still if you can help me out with some link to find out the best n reasonable place to live in NSW with my family. I am a sailor by profession and most likely would be preferring the place with maximum seafarer on/off shore jobs. Well, you can use my page called Getting a Job or a Sponsorship to search for jobs by your profession which would in turn help you decide where to live exactly. But nobody can help you with ‘best places to stay etc’ until you define what you mean by ‘best’. For some people, that’s an expensive area and for others it’s the cheapest. Some like the countryside, some like the city. Hi Bob. How you going? Congratulations on this fantastically well done job with this site. It really is a comprehensive one with just about everything one needs to know about making the big move, before and after it. My request is for information from someone local or someone who’s recently moved in. We’ve secured a 190 PR from NSW and are planning to arrive by Mid August from New Delhi, India. Its me, my wife and our two daughters aged 7 & 13. So far, a Sydney suburb seems the most likely option for us to look at. Just that there are so many of those, it makes it a bit difficult to zero in. Just one last thing. Besides the rentals, how much more would it cost a month to cover basic utilities. Shall be much obliged if someone could help us understand this and other important things we may need to know to make an informed decision about the place to chose. Yes, you definitely need a local to help you out with this, I just wouldn’t know. Somebody may see this and help you out here, but I think you would be better off checking out the comments on my page about Sydney as there is a lot of talk about the various suburb and where to live. Thanks for the prompt response and the apt suggestion, Bob! Shall do that right away. I can’t advise you in respect of which state might sponsor you, you would be better off speaking to a MARA registered migration agent about that. Also, check out my page called Getting a Job or a Sponsorship for more help. First of all, I would like to thank you for providing such a beautiful site with detailed information. I am a single parent of my 10 year old daughter. I have applied for the visa of SC190. I have experience in Administration and Human resource sectors. Kindly guide me to select an area to work and live in Sydney. You can research jobs on my page called Getting a Job or a Sponsorship and I would suggest you decide where to live after you know where you are going to work. You will find lots of advice about the suburbs of Sydney on my main page about that city. Well, Sydney is the obvious choice, especially for finding work, but I’ve heard Newcastle is quite good as well. I’m not local to the area though, hopefully somebody who is will give you their opinion. Thank you for your website. But be awere that with the 489 visa people must have worked full time in the regional, low population-growth or designated area for at least a year while you held your skilled visa. The work could be in you occupation or another field. Hey TG, when are you moving? or have you already moved? I am also from Sri Lanka. My wife and myself have got invitation for NSW Far south 489 visa. I am also in the IT Field (Systems Engineer). I have been doing some research on the internet and was not able to find adequate details on which city/town we could move into. We are planning to move in somewhere around mid June 2018. Please let me know how you guys managed to setup yourself and advice of getting a job in the IT Field. Any tips and Advise would be really appreciated. I am from Sri Lanka too.I am also in the IT Field (Software Engineer). I am planning to move FSC area soon. Have you finalized an area to live and work? I would love to hear from you. We are about 6 months away from completing our long awaited visas. My husband is a builder and has been offered sponsorship in NSW. I wanted to move to Melbourne. Can you yell me what are the best family suburbs to bring children up in please? we have two boys aged 14 and 7 who are in very good football clubs so will need to have that here if at all possible? we have a 2 year old girl too. Our main aim is living in a suburb which has teenagers for my son as he does not want to move away from his friends here in the UK, and good schools? any help would be greatly appreciated as i am loosing the will with all this at the minute. I will leave this one to the locals Tiffany, I don’t know New South Wales well enough to help. Maybe you could clear up exactly where in NSW you’ll be moving to? If it’s Sydney though, you may be best off asking this question on my page about Sydney and also reading the comments that have already been made there. For schools, you may want to check out my page Which school? Sutherland shire in the south has good schools and a pretty large weekend sports program for teenagers, close to good beaches it is a typical middle class area with good transport links to Sydney cbd..but it depends on how much money you have…for some it is too expensive for others too cheap…the further south and west you go the cheaper things get which is typical for sydney..further west is cheaper..until you hit the blue mountains..my mother and sister still live in the sutherland shire i haven’t lived there for near on 15 years..
Hello, young family relocating from Melbourne to Northern Rivers of Nsw. Location flexible. Possibly Lismore, Ballina or Byron Bay. Worried about the crime, everything I read on the internet suggests it’s pretty rough and drugs are a huge issue. I know you can’t believe everything you read, so would love to hear from people familiar with the area to shed some experience? Yes, there is a bit of a mention of that in earlier comments in this thread. Byron Bay is well known as a bit of a hippie town, so no surprises there. It’s quite a nice town to visit for a holiday, been there a few times myself, but I don’t think it sounds like the kind of place you would want to live in. It’s a fair bit quieter slightly further up around Kingsciff to Tweed heads, so may be worth having a look that way. Other than that, hopefully somebody who knows the area better than I do will help you out here. The first four are definitely lower in crime than Melbourne!! Unfortunately drugs seem to be an issue every where ….. Even in the outback. Yamba was voted the most desirable place in Australia to live a few years back. Re Maclean Scottish capital. Places like Glen Innes have a celtic festival every year and have replicated Stone Henge there. There is also a place south of Bowral as well which celebrates Scottish ancestry. Also Highland games are celebrated in Qld too. As a true blue Aussie I can honestly say to all people emigrating here, Qld is the most difficult state to settle in. If you think it is a culture shock, so do we who move there and return back to our home states after a few years. As for Gold Coast stick with Coolangatta/ Tweed area or Kingscliff, close enough to be far away from the GC strip. Toowoomba, Sunshine Coast and Hervey Bay nice places. As for NSW, population in Newcastle over 1 million. Beaches great in NSW and plenty of them accessible compared to Qld, with some beaches too remote and can’t swim due to jellyfish or crocs. But if you deem it necessary to live up north I suggest try before you buy. If you harken for snowy slopes then Canberra, Riverina and Vic are the go. If you wish for rural, well houses, rates and fuel cheaper at the moment than the major cities and towns. My suggestion is research where you intend to go. Ask questions to people on swap and sell sites on Gumtree. Better hearing it from the locals. Good luck to each and all with your emigrating here. Well I had no problems at all settling into Queensland, and I love it here, I wouldn’t live anywhere else. I must stress though, I’m talking south-east Queensland, specifically Brisbane. If you want to go further north or into remote Queensland, yes, I can imagine it would take some getting used to. But Brisbane and the south-east is fine. I’m wondering whether you meant, literally, when you said “state”, meaning you were only comparing to other states, or whether you were also comparing to NT. In the absence of a reply from Sharon, may I offer my two cents worth? Generally speaking, when people talk about states in Australia, they are also talking about territories as well. Even so, I’m not sure you could conclude that Sharon thinks NT is easier to settle into in some parts of Queensland, it’s more likely that she has never tried to settle in NT. Of course, I’m guessing, hopefully at some point Sharon will read these updates and get back to us. As for Northern Territory, I assume you will be looking to live in Darwin? I’ve been to Darwin for 10 days, it’s certainly different. You can definitely class it as a large country town rather than a city, and it is most definitely an acquired case. If it does represent your best opportunity of getting to Australia, I would certainly take it, it would be an interesting experience. That way you could find out for yourself if you end up being one of those people who think it’s a paradise or a hell. Thanks Bob, your comments are helpful. When I am at least a little bit further along in the process I may well post on your Darwin page. Your comments are somewhat similar on the love or hate aspect, as those I got from an older Australian couple I am fortunate to have gotten to know. He recommended to, if possible, arrive in the dry season first adding that if I survive the first “wet” (season) then I might fall in love and not want to leave as he’s under the impression that that happens to more than a few. Apparently the temperature doesn’t get much above 90 (about 30.6 to 32.6 in Celsius…year round) but the humidity can be an issue..I’ll be following that by remote through a website I’ve found (weatherzone.com.au/nt/darwin-daly/darwin) but I’m cautiously optimistic about at least “surviving” for two years..the visa side I’m still at an early stage…but finally taking more definitive steps forward with fingers crossed..
Best wishes to you and your family Bob..and best wishes for your health.. Yes, everything you’ve been told by your Australian friends about Darwin is true. Personally I think it would be interesting to live there for a couple of years to see what you think of it. I’d give it a go if I needed to.